I am still one book behind on my Goodreads’ challenge, but I’m making progress. I vowed to finish both Chaucer’s Tale and Rubicon by today; that did not happen. However, at least I’m not spiraling out of control. 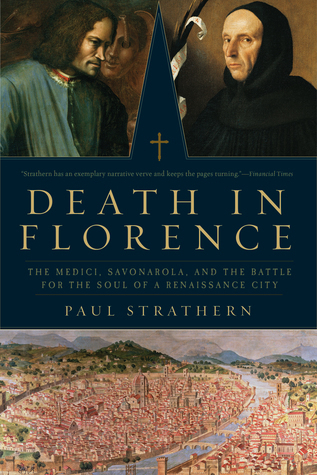 Along with Rubicon by Tom Holland, I’m reading Death in Florence: The Medici, Savonarola, and the Battle for the Soul of a Renaissance City by Paul Strathern. lucrative Tolfa alum mines owned by the papacy. I gave Chaucer’s Tale: 1386 and the Road to Canterbury by Paul Strohm 4 stars. It was good, but not great. The first half offered a decent look at Chaucer’s London, but not Chaucer himself.